If you are like most people, you probably have several value electronic devices. Televisions, stereo equipment, computers, and other electronics can be destroyed in an instant as the result of a power surge. Protect your expensive equipment by investing in surge protection services from Rowell’s Services. Are your home and valuable electronics protected against power surges and lightning? Probably not. Unfortunately, most homeowners wait until disaster strikes to invest in the right type of surge protection. Many homeowner’s insurance policies do not cover damage caused by lightning strikes. The average American home is hit by more than 20 power surges every single day. 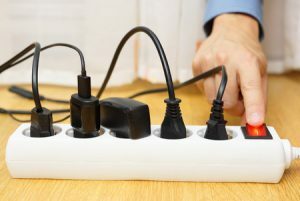 Using surge protectors extends the life of appliances and electronics by as much as 30%. When lightning strikes up to a mile away, it can cause serious damage to sensitive equipment. At Rowell’s Services, we offer a range of surge protection products and services to protect your valuable electronics and provide you with peace of mind. Whole-home surge protectors are installed at your circuit breaker, and they prevent power surges from reaching your electronic equipment. They are the best way to protect your entire home from all types of power surges. Rowell’s Services offers several options for whole-home surge protection, and we can help you determine which is best suited to your home. When you choose us for your surge protector needs, you can rest assured knowing that your new equipment will be installed properly and protect your sensitive devices from harmful power surges. Surge protectors are more affordable than many homeowners realize, and they can save you thousands of dollars by preventing premature system failure. If you are interested in surge protection for your Northfield, New Hampshire area home, please contact us today. Call 603-934-4145.